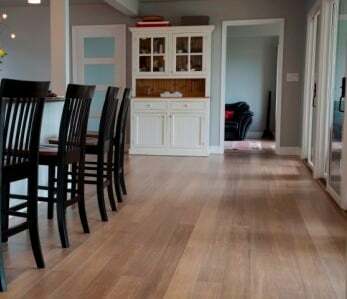 It looks great in the home, has numerous benefits and is an excellent choice if you want a material that has better overall green credentials than wood or composite flooring. Of course, when it comes to bamboo flooring, cost is one of the main issues that crops up when people are contemplating the best option for their home. Surely something so good for the environment has got to cost more? Whether you are installing the flooring yourself or asking a professional to do it for you, getting value remains top of the list for many home owners. The cost of new flooring involves a substantial outlay and it’s no surprise most people want to get as much bang for their bucks as they can. The great news is that bamboo flooring cost not only compares favorably to hard wood flooring but is often significantly cheaper. There are also some added benefits that make it lower maintenance. 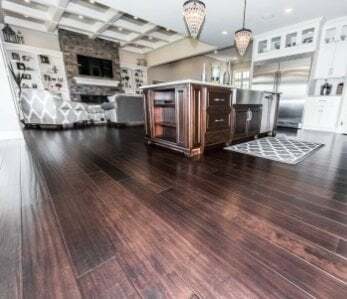 For instance, whereas hardwood floors traditionally need refinishing after 10 years, strand woven bamboo flooring with aluminum oxide finishes typically don’t need to be refinished for at least 20 years.. If you’ve only come across the concept of bamboo flooring recently then you may be amazed to learn some of the great benefits it provides and what an excellent flooring it makes. that strand woven bamboo is much harder than traditional hardwoods, in addition to being an attractive and sustainable alternative. Bamboo is actually a grass so it grows differently than a tree like oak. Where a tree takes years to form and mature, some types of bamboo can grow by several feet every day which means that, as a flooring material, it can be produced more quickly and with less of an impact on the environment. It can also grow in poor soil conditions. After boiling, the long strips of harvested and cut bamboo are then dried and glued together in vertical or horizontal grains, or woven together and compressed to form strand woven bamboo, which has a beautiful marbled appearance. When finished and treated, these have the same look as hardwood flooring. The truth is that bamboo flooring is a lot more versatile than hard wood and comes at a cost that won’t break the bank. Bamboo flooring cost can be found for half of the price of traditional hardwoods, and sometimes even less, so straight away you are getting big savings by choosing bamboo over wood. 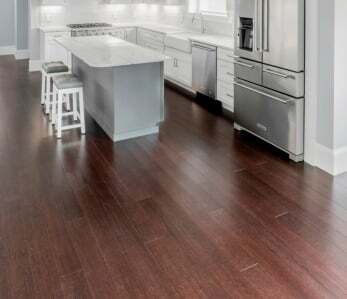 At Ambient, our prices range from about $2.80 up to $4.00 per square meter and products are available in a wide range of styles and different grains. You can even get a mix of different colors from almost white floors all the way to rich dark chocolate ones, and some even made with wood prints to resemble wood floors. Bamboo flooring is designed to last a pretty long time and is highly durable which is why many people choose it over and above traditional wood flooring. Both look fantastic but bamboo flooring is the more resilient which means the initial cost is spread over a longer period. Not only is the cost of bamboo flooring better than comparable hard wood floors, there are plenty of benefits too. Bamboo flooring is easy to lay and can be used in almost any room of the house. It is also great for businesses of all types and has been used everywhere from large offices to busy hospitals. The distinctive grain and flexibility allows for a much larger range of styles and textures that can add a good deal of class to any room. It’s ecologically friendly and long lasting. 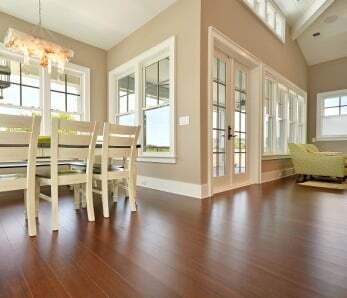 Bamboo flooring is also easy to clean with the combination of a suitable hardwood cleaner and a slightly damp mop. Bamboo flooring is easy to maintain and shouldn’t lead to additional expenses over its lifetime. The material is more resistant to problems such as water damage and warping than hardwood floors. You can save on bamboo flooring costs by installing it yourself if you have enough DIY experience. Bamboo flooring is highly resistant to termites. It also doesn’t harbor things like dust mites and is great if you want a flooring that protects allergy sufferers. You’ll probably never have to refinish bamboo, whereas with wood you’ll have to refinish it at least one time within 10-20 years and sometimes more often depending on the softness of the wood and finish. The bamboo we use is harvested from well-managed forests that are big on sustainability. This mean that we can produce quality flooring that is some of the most eco-friendly on the planet, helping you to contribute to a more carbon neutral future for your children, all at a cost that doesn’t burn a hole in your bank account. The notion of rapid renewability is important here. Whereas a hardwood floor is considered simply renewable (if managed properly), bamboo replenishes a lot quicker because of its growth cycle. That means it can be produced at a very low cost and is a more sustainable option than other materials. The problem with many green alternatives is that they can come with a significantly bigger price tag which often puts people off. 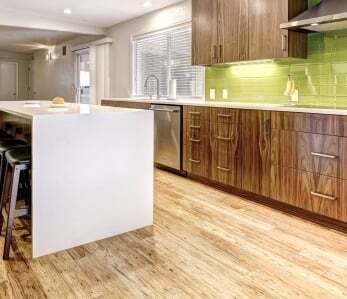 If you care where your bucks are going and want to get the best value, then bamboo flooring cost is highly comparable with other products on the market. Combine this with the ease of laying the flooring and low maintenance issues over its lifetime, then you have a product that is great value for money and helps you save the environment in the process. When considering cost in relation to other products on the market there really is no competition. ‹ What Does Sustainability Really Mean and How Can You Get on Board?